Happy New Year from the H.E.S.S. Collaboration and welcome back to the H.E.S.S. Source of the Month blog! Each month, we will feature one of the latest ground-breaking discoveries from the H.E.S.S. Collaboration. We're happy to bring back this long-running series (2004-2013) and be able to share with you some of our most exciting results. Fig. 1: An overview image showing the H.E.S.S. Galactic Plane Survey (HGPS) region (top), the measured TeV gamma-ray flux (middle), and the observation time (bottom). For reference, the all-sky image shows the distribution of gas in the sky, as revealed by recent carbon monoxide (CO) measurements by the Planck satellite (Adam et al. 2015). Overplotted (triangles) are Galactic gamma-ray sources measured at lower but complementary energies, recently detected by the Fermi-LAT satellite (Ackermann et al. 2015). The 15 Galactic TeV sources known to be outside the HGPS region are also indicated (stars). The regions covered by earlier, more limited surveys are also illustrated. The middle panel show the HGPS gamma-ray flux above 1 TeV (correlation radius of 0.4°), and the bottom panel shows the respective observation livetime. The white contours mark the edge of the survey region. As we come upon the ten year anniversary of the publication of the last major results from the H.E.S.S. 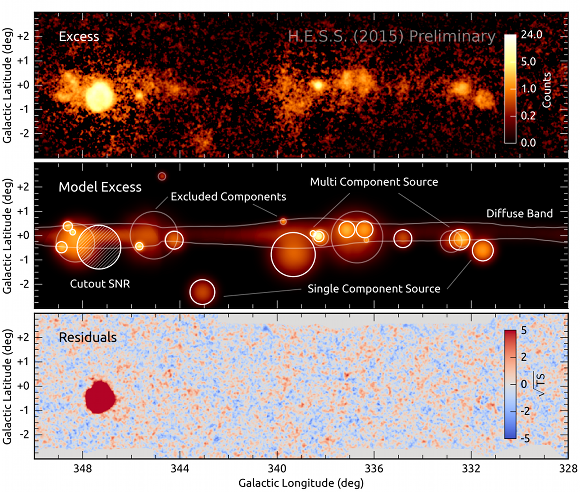 Galactic Plane Survey (Aharonian et al. 2006), we mark the completion of this decade-long observation and analysis program. The HGPS now covers a substantial fraction of the Milky Way (which appears as a rectangular band, or "Galactic plane", from our perspective on Earth) that is visible from the Southern-hemisphere site in Namibia, where the H.E.S.S. telescope array is located. It goes well beyond the +/- 30° in Galactic longitude previously covered, and it is wider in Galactic latitude too, reaching +/- 5° in some areas. 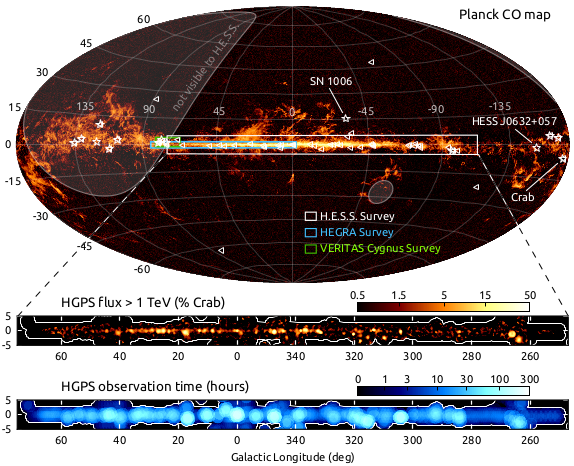 Figure 1 shows an overview of this coverage, as well as a panel showing the TeV (tera-electronvolt) gamma-ray flux along the Galactic plane. The latter immediately demonstrates one of the most remarkable conclusions from the HGPS: the Milky Way is absolutely brimming with TeV gamma-ray emission! The final HGPS is not only vastly improved in terms of its spatial extent but also in its depth. The unprecedented TeV dataset now comprises 3000 hours of telescope observations, more than 10 times the exposure available in 2006. This has directly led to increased sensitivity to TeV gamma rays (Fig. 2), now at a level of better than 2% the flux of the Crab Nebula (a standard candle in TeV astronomy, see SOM 2004-10) everywhere and, in many regions, better than 1% Crab. More sensitivity means the ability to probe more of the Galaxy for the first time at TeV energies, whether it be more distant sources or fainter, nearby sources. Fig. 2: An image of the sensitivity of the HGPS for the detection of point-like sources with an assumed power-law spectral index 2.3. The bottom panel shows a map of the sensitivity in Galactic coordinates, and the top panel shows a slice through that map at a Galactic latitude of 0° (the nominal center of the Galactic plane). At latest count, the HGPS has led to the discovery of 77 such sources, the vast majority of the known Galactic TeV source population. To both detect and characterize these sources in a consistent way, years were invested to develop a new software "pipeline" to perform standardized analysis of the entire HGPS dataset at the push of a button - a first in Cherenkov astronomy. The HGPS pipeline utilizes an advanced method (multivariate analysis machine learning) for separating the gamma-ray signal from background noise (Ohm et al. 2009), resulting in a further 20% boost in sensitivity with respect to earlier, classic methods, while using the exact same dataset. It is also able to detect individual TeV gamma-ray sources in very complex regions of the Milky Way better than ever, by disentangling overlapping gamma-ray emission coming from multiple sources (SOM 2013-04), thanks to the implementation of modeling based on 2-dimensional maximum likelihood estimation (Refsdal et al. 2009). The detection of diffuse TeV gamma rays in the Galaxy (Abramowski et al. 2014) motivated us to model not only discrete sources but also the faint, large-scale emission that is evident upon closer inspection of the HGPS maps. Figure 3 shows a schematic view of these procedures at work in a sample region. Fig. 3: An illustration of the procedure used to construct the HGPS Catalog. The top panel shows the TeV gamma-ray excess after background subtraction, the middle panel the fitted model with various source components labeled, and the lower panel the residual significance after modeling, demonstrating a good (smooth, or flat) background normalization. Detecting such a large population of TeV sources in the Milky Way is exciting, but we want to know much more: for starters, what exactly are these sources? What astronomical objects are at the origin of this emission, and how are they able to produce gamma rays of such high energy anyway? To get a better grasp of the TeV source population, the HGPS program methodically studied the detected sources' associations with known or suspected counterpart objects in other catalogs at lower energies (detected with other telescopes). We found that the largest class types firmly identified with TeV emission were pulsar wind nebulae (PWNe; e.g. SOM 2013-07), followed by supernova remnants (SNRs; e.g. SOM 2010-10) and composite systems (COMP) - where both the nebula and supernova shockwave may contribute to the TeV emission (e.g. SOM 2009-11) - and, finally, high-energy binary systems (e.g. SOM 2011-09). But perhaps the most intriguing finding is that a large number (about 50 sources) cannot yet be firmly identified at all (Fig. 4). Although some tentative associations have been proposed for a number of H.E.S.S. sources, clear evidence is still lacking for the majority. Further studies and observations will hopefully unravel this mystery. Fig. 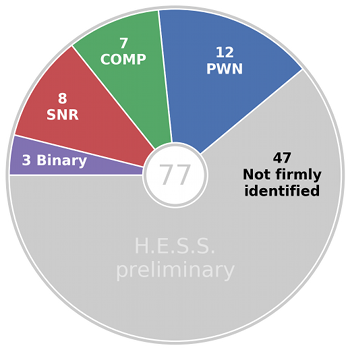 4: A pie chart showing the breakdown of HGPS sources into different TeV source classes based on firm identifications with multi-wavelength counterparts such as pulsar wind nebulae (PWNe), supernova remnants (SNRs) and composite systems (COMP). 47 sources are unidentified. Most of these have multiple possible counterparts, and only for some no promising counterpart could be found. Among the 77 HGPS sources are 16 new source discoveries never before published in scientific journals. All are currently unidentified, but some appear to be PWNe due to their proximity to energetic pulsars, while others appear related to SNRs. And a few are true mysteries: they don't seem to have any convincing counterparts in other astronomical catalogs. You can expect to see some of these brand-new, enigmatic sources presented in detail in future installments of the H.E.S.S. Source of the Month blog. Reference: Abramowski et al. (H.E.S.S. Collaboration), "The H.E.S.S. Galactic Plane Survey", in preparation. Currently undergoing internal collaboration review prior to submission.